Combine the wine, herbs and garlic and season. Place the lamb in a Tupperware box and pour over the marinade. Seal and leave overnight in the fridge. Wash the leeks, dice finely, then place in a pan with the 425ml of double cream, garlic and seasoning. Bring to the boil and leave to stand for 20 minutes. Shred the sage and mix into the cream. Scrub the potatoes and cut into 5mm slices. In a 25cm-square ovenproof dish, layer the potatoes with the leek and cream mixture, ending with the cream. Cover with baking paper and place the dish on a baking tray. Bake at 200°C/gas mark 6 for 25 minutes, then uncover and bake at 180°C/gas mark 4 for 45 minutes. For the cream sauce, bring the 150ml of cream to the boil and reduce by half. Using a hand blender, add the oil and some pepper so that the sauce is light and frothy. Add salt to taste. For the jus, sauté the onion, garlic and leek in 2 tablespoons of olive oil, add the morels, wine, stock, bay leaf, tomato purée and peppercorns. (If you have any lamb bones, add them now.) Bring to the boil and skim off any impurities. Simmer for 1 hour, strain and return to the heat. Add the rosemary and reduce to about 300ml. Just before serving, remove the rosemary, season to taste and blend in the extra virgin olive oil using a hand blender. Remove the lamb from the marinade and pat dry. Seal the meat in a hot sauté pan with a little olive oil. When it is browned, place in an oven preheated to 180°C/gas mark 4 for 10-15 minutes. Leave to rest for 10 minutes before carving. 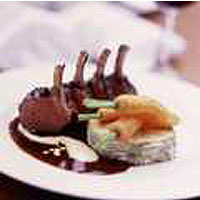 To serve, place a portion of dauphinois on each plate with 3 lamb cutlets, a little of each sauce and vegetables of your choice.